What if everything you love was taken from you in the blink of an eye? 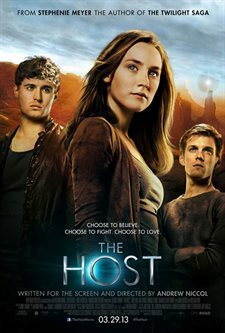 "The Host" is the next epic love story from the creator of the "Twilight Saga," worldwide bestselling author, Stephenie Meyer. When an unseen enemy threatens mankind by taking over their bodies and erasing their memories, Melanie Stryder (Saoirse Ronan) will risk everything to protect the people she cares most about — Jared (Max Irons), Ian (Jake Abel), her brother Jamie (Chandler Canterbury) and her Uncle Jeb (William Hurt) , proving that love can conquer all in a dangerous new world. Download The Host in Digital HD from the iTunes store. The Host images are © Open Road Films. All Rights Reserved. Taking her new book to the screen, Producer Stephenie Meyer tries for a good opening this weekend for the film adaptation of The Host. Hitting the target audience with a jolt of romance fantasy, the teens to twenties females should give the film a strong attendance. However, with hardly any promotion of the film, the male audiences will have to be dragged to the movie by their dates. With a hint of the love triangle from Meyer's Twilight Saga series, the film should do well at the box-office. In The Host we find Melanie Stryder (Saoirse Ronan) one of the last humans on Earth running from alien predators that have all but eliminated the earthlings by implanting themselves in their bodies. In one last dash for freedom she leaps from a building crashing to the street below. Still alive, but barely, a top alien cop called a Seeker (Diane Kruger) gets Melanie to a waiting medical ward where they insert a host into her body. Melanie's strong will to resist control of her mind however, creates a different effect on the body than the other hosts that have taken over the world population. Under a spell of sorts Melanie's host finds her way to a rebel stronghold in the dessert where she reunites with a family member and love interests Jared (Max Irons) and Ian (Jake Abel). When the Seeker finds a route to the hide out, the danger grows. I like the way director Andrew Niccol (In Time) handles the fantasy part of the film. He brings the aliens in story from other galaxies and with some very good special effects, inserts them into people. Although the process seems diabolical, it's not any stranger than the pod transformations in the film Invasion of the Body Snatchers. The cloned people take on a blameless attitude much like the human looking extraterrestrials who take over the Earth in the television series V. I like that in this movie the invaders have these glowing blue eyes that identify them as the adversary. Niccol makes his ‘hosts' business as usual with their determination to populate the Earth except for one flaw. The acting in the film has some standout performances by Ronan, Max Irons and Jake Able as the three caught up in a love triangle that's reminiscent of Twilight Saga's Bella Swan, Edward Cullen and Jacob Black. But the romance in The Host has a twist, finding the love interest of the triangle inside the body of her shell. Here director Niccol does an excellent job of keeping the audience guessing and vacillating between who will become the ‘last woman standing' Melanie or Wanda. Saoirse Ronan has double acting duty as on screen Wanda and being the voice over for Melanie, who's stranded inside her new host. Keeping it real with expressions, some of surprise and even embarrassment, Ronan puts on a good show as the girl torn by her earthling resistance convictions and a duty to her alien brotherhood. In one scene as Melanie fights for the guy she loves, but it's Wanda who gets to kiss him creating a jealous rage from the inside out. At the screening of The Host I had the pleasure of sitting with two fine young ladies, 19-year-old Karla and Nadia who turns 21-years-old today (Happy Birthday Nadia). I observed their reactions as much as I could during the showing of the film and saw that at times Karla was getting antsy while Nadia seemed glued to the screen. I asked the two if there was any downside to the film and both said although there could have been less build-up which took a lot of time, they enjoyed the movie and recommend it to others in their age group. Nadia did say that she was disappointed that there wasn't enough promotion for the film like they did with the Twilight series and said it may hurt attendance. Of their favorite characters, they both couldn't seem to resist agreeing that both Max Irons who plays Jared and Jake Able as Ian O'Shea are the leaders of the ‘screen crush' pack. The Host has been rated PG-13 by the MPAA for some sensuality and violence. If your preteens have seen the Twilight Saga series, most likely they have already experienced as much kissing and aggression that's shown in this film. Oh my gosh. I have to see this.!!!!! So pumped going to see it in two hours !